Always start by checking your alignment, particularly after a layoff. I�ve really not been playing much in recent months, so when I started practicing again recently I knew right away that I wasn�t hitting center cue ball. In fact, I couldn�t even find center cue ball. It was obvious that my alignment was way off. Of course, this isn�t new. It�s happened before and it always gets me to go back to basics. Proper alignment is so critically important in pool at all levels of play. You have to be able to trust that your alignment is solid. Everything starts from that point. Sometimes you think you are striking center ball, but you�re not. And if you are off center by even fractions, it can be massive and make a huge difference in your accuracy and success. This is particularly important when you find yourself in a high-pressure situation. Holding your nerves steady is hard enough, but if you can trust that your alignment is solid, you�ve got a good chance of making a good shot. Here are a few simple drills to figure out what you�re doing wrong and how to get you back on track. These may seem incredibly basic, but trust me, even the top pros do these drills when they are struggling with their alignment. The first drill (Diagram One) is the standard lag drill. Shoot the cue ball straight up table and back (Shot 1). Follow how straight the return is. You may be striking the cue ball with a touch of left or right without even realizing it. Another way to do this drill is to hold your cue in place on your follow through and see if the cue ball comes directly back to the cue tip. It should. Practice this at least 10 times and as many as 20. What I will also do is shoot the cue ball hard at the diagonal pocket and try to hit the very center of the pocket (Shot 2). Hitting it hard will free up any flaws in my stroke. In Diagram Two, I put my alignment to the test. 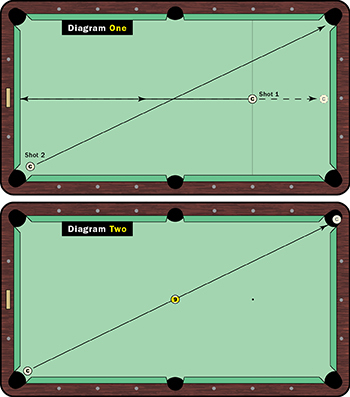 Place the cue ball a couple inches from the corner pocket and the 9 ball at the center of the table. Shooting the 9 into the diagonal pocket is the goal, but the secret to this shot is to look through the 9 ball and see where the cue ball needs to hit the back of the pocket. I don�t even look at the 9 ball, which frees me up to focus on the cue ball and the target point in the corner pocket. Do this drill using follow, stop shots and draw shots. You will get immediate feedback about any flaws or movements in your stroke before you strike the cue ball. After I�m comfortable with this process, I start to look at the object ball and the point of the pocket I need to hit. This gives me great guidance. I use this drill during my matches and it really helps when I�m under pressure. We all know that long straight-in shots are tough, so having a guide is great. Regardless, though, if you are not striking perfect center cue ball, you will still miss the shot. That is why this is such an important drill. This foundation will help your fundamentals for all shots.